The sun was trying to rise on a dewy warm morning, its anticipated intense rays muted by heavy cloud cover. Yellow and pink bursts of luminous watercolor radiated through fissures in the dense atmosphere. Ibis perched atop towering light poles unsure if it was time to begin the daily search for sustenance, their instincts on pause. We were well underway, gliding down University Drive on one of those lazy summery Saturday dawns when the world is quiet and few are in a hurry. The north half of the county was behind us, the West Terminal was serviced, and a familiar silhouette separated from the bus stop shelter as we approached Stirling Road. He was a young man with an old soul, a common condition leading to confusion and despair. Its negative effects can lead to paralysis of initiative. After several weeks of gloomy expressions, today the light was on. 'Ready for another exciting Saturday?' My rhetorical greeting is a mixture of curiosity, encouragement, and personal pep talk. "Better days, man. It's better days." His bright response lit up the bus, spurring us onward on our journey. His smile smoothed away the wrinkles of worry and he was suddenly his age again. The pedestrian bridge over University at Miramar Parkway with an especially steep ramp was in full use that morning. No pedestrians however, just a crossfit group using it as their private gym, huffing up the incline with weights and other forms of resistance. In Coral Springs an infrequent rider with striking features loaded her bike on the rack backwards. As a courtesy I pointed it out to her, she said she'd watch it - and stayed up front to do so. In Tamarac a young man with reptilian facial tattoo boarded, earbuds deafening my greeting. At the stop on the curve just north of Oakland Park Blvd, a small girl sat alone, no visible sign of a chaperone. She was just a toddler, and it was disturbing to see her beside a major street unattended. Someone pulled the cord to request the stop, and as we pulled over an older woman who was hiding behind the shelter emerged. Grandma was smiling as the little one ran to greet mommy exiting the bus, soon hand in hand walking home. A fixture on University, Douglas stopped in for a short trip. Talky in the NYC tradition, where one topic turns into another and still another, he reminisced about traveling to Switzerland as a teenager when his father worked for an airline. This somehow transitioned to visiting Google Sky to see the stars, asking if I was a Christian, and announcing he was heading to Broward Mall to do surveys. Hours later, the crossfit crew were still at it, taking advantage of the overcast to work up a sweat. Up and down the concrete hill like Sisyphus, their efforts were not futile. I occasionally hear other operators lament that our service is pointless, since we don't produce anything of value. The results aren't always apparent and sometimes things look bleak. As you toil up and down our avenues and boulevards, please know that carrying people, making connections, looking out for each other, and moving a county are worthwhile endeavors. Your service is priceless. Route 31 rolls up and down Lyons Road all day. That's not totally true. Another segment of the street is called 31st Avenue, and another is called Martin Luther King Jr Avenue depending which stretch you're on. The 31 rolls on all of them, and makes a side trip on Coconut Creek Parkway to service Broward College North Campus. Numerous school zones line the route, from the aforementioned college down to grade schools, so it's a popular route at certain times with students. During summer break the kids are scarce and the route resembles a typical neighborhood route. A summer morning went along as expected. Morning traffic made for a couple hectic trips. Francois, a regular on the 60, stopped in; he still hadn't found his lost cell phone. At Boyd Anderson High, a vigorous ackee tree shaded the bus stop and reached out over the street. At Broward College, a rider did his good deed for the day and turned in a wallet left behind by a student. I neglected to mention a few more turns on the route. At the south end, after so many miles on the same road, we veer onto NW 19th St, then down NW 15th Ave, and east on Sunrise Blvd. For about a mile we share Sunrise with the 36 before cutting south on NW 7th Avenue on our way to Central Terminal. And on Sunrise resides a legend. A rider since the earliest days of BCT, maybe even earlier, he rolls his wheelchair slow and steady along the boulevard. He's waiting now, takes one last deep drag on his cigarette and turns his chair in preparation. As he enters backwards, the ballast lost by having one leg is more than offset by the ever-growing layers of bags hooked behind him. They now protrude enough to prevent his making a smooth turn into the bus cabin, brushing against the doors. Still, his persistence and determination see him through. The bags are wet from last night's rain and the books within are saturated. Nothing else is identifiable in the camel's hump mounding with the collections of life. Once inside, wheels stable, hands free, he removes his pass from his mouth and reaches forward to swipe it through the fare box. The box isn't happy and spits out a raspberry. "Oooh, that's the wrong sound," he declares matter-of-factly as he reswipes and receives a positive validation. "Ah, that's the sound." He's a little jokey this morning, and the dampness hasn't affected his dry humor. "Turn left." His loud order comes, insincere instruction since he knows we turn right here. 'OK, if you treat us all to Miami Subs, we can go through the drive thru.' My response didn't faze him. He enjoys these bouts, his agile mind and fierce wit unhindered by his life-ravaged body. A van chose that moment to cut us off. "Why didn't you hit him?" He delivered his calculated strike, seeking an equal response like a prize fighter in the ring with an unqualified opponent. 'I need more of a challenge than that.' My counter-motion would hopefully diffuse the verbal pummeling. "Risk Management would pay everyone on this bus - including you - $15,000 in an accident. But it might take up to three years." His high volume suddenly involved everyone else on their morning commute. One of them took a moment to register the new information: "Ha. Three years." We were done turning. All roads lead to Central Terminal, and our road had ended. School bells, rustling branches, air brakes, facetious exchanges: the streets will carry the sounds of Life as long as we are there to hear them. 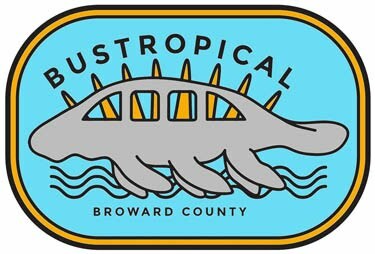 Atlantic Boulevard is a major east-west thoroughfare through the northern part of Broward County, starting out as a few lanes east of the Intracoastal and soon fanning out as land opens up westward. A1A is our coastal highway, a thin band of asphalt on the interminable barrier island between the Atlantic and the mainland with nowhere to grow, lined on both sides by countless condo towers where occupants live at the edge of the endless sea. Curiously, Coral Ridge Drive in Coral Springs at the west end of Atlantic Blvd, far inland with no hint of salty air, has neither coral nor a ridge. Apart from occasional tree islands, it is historical River of Grass territory, long ago drained and dried to develop the desirable community we see today. Route 42 is dedicated to Atlantic Blvd, plying the relatively short distance from A1A to Coral Ridge Drive and only diverting to service the Northeast Transit Center in Pompano. On a Sunday morning, this trip takes about 45 minutes. A weekday afternoon may take twice as long due to the crippling congestion which gathers at predictable hours. It was my good fortune to have it on Sunday mornings. "My mom died last week. She was 91." 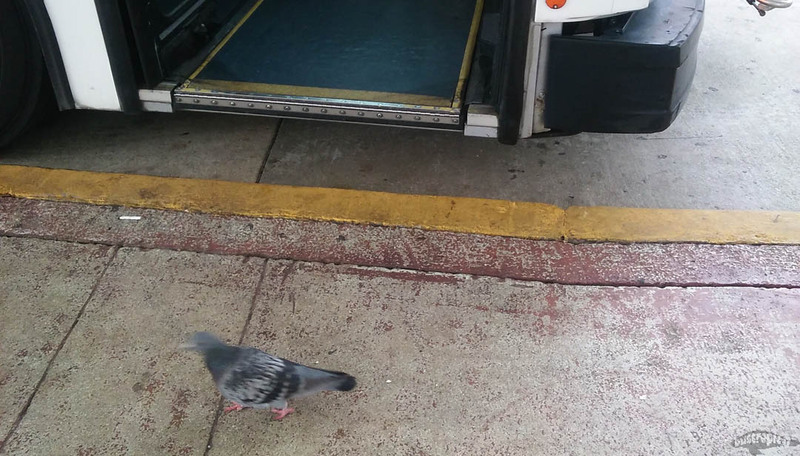 Marty announced the sad news almost as soon as he entered the bus. "She just went to sleep and didn't wanna wake up. She was 91. She was tired. My two sisters died early this year. My brother's been missing five days - I don't know if he's in the hospital or in jail. He has the key to the house so I've been sleeping in the garage, sweltering." Marty only speaks in one voice: bus voice. That's at a volume the entire bus can hear. He had some internet fame a few years back courtesy of then-local YouTuber Vitaly who funded an extreme makeover for this sympathetic character. Now, he's back hustling on the streets (but never a bother on the bus). Small in stature and vulnerable in spirit, it is impossible to dislike the man. He's out here struggling against the odds, and goes to pains not to get in anyone's way when doing it. While I get stymied by a wonky wheelchair ramp, Marty accepts everything with gratitude. After the transit center, my pal Al stops in for a brief trip. Next, the Indian girl with enviably long black hair boards on her way to work, at her usual stop under the oak trees. Out west, approaching University Drive I could see my mature friend in her distinctive ball cap waving from the median. Flag stops are a no-no as they encourage unsafe crossing through traffic, so I couldn't acknowledge the request. Fortunately we were servicing the stop anyway for a crowd exiting, which gave her time to make it over. 'You trust all these crazy drivers?' I asked, thankful she'd made it through with her labored walk. "No! But I didn't want to wait for you to come back around." The heat was getting to her and the cool cabin of the bus was too enticing. I was kind of glad she did, since the mechanic worked on the wheelchair ramp at the layover and it saved her needlessly melting by the street. Over by State Road 7 another elderly passenger boards, holding out his money to show he's a little short on fare. "Next time, I promise," he said with conviction. 'Yeah, I know your promises.' It was a snarky response I immediately regretted, and resolved not to repeat. "I only work one day a week now." His depressing admission made his attempts to pay his way admirable. He was an honorable man unprepared to let go of that virtue. A few minutes later, we pulled up to Powerline Road, where a far younger man - in his 20s - was waiting. His arms were tucked against his chest, squeezing a drink and loose papers. A cigarette pack balanced on his forearm while fumbling for bills in his wallet and change in his left hand. "Oh man, I got some big bills, but only this for a pass." Again, a passenger making a fair effort to pay the fare. He had more change than he thought but held on to it, whispering "That's for a drink." On the return trip, he was waiting where he'd exited, this time with a bicycle. "I had just enough money for my medication." He informed me, picking up where we left off. "God bless you." He thanked me again and offered a fist bump. Even tree islands aren't isolated, connected by life-giving waters acting as avenues of travel for fauna and peoples now forgotten. Try as we may in our time to plant ourselves at a distance from unpleasant interaction, the river of Life feeds our roots and unites us with each other.